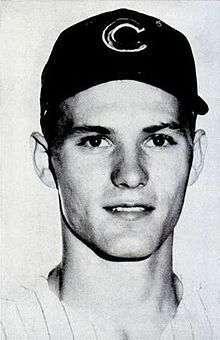 Kenneth Douglass Hubbs (December 23, 1941 – February 13, 1964) was an American professional baseball player. He played in Major League Baseball as a second baseman for the Chicago Cubs from 1961 to 1963. He was killed in a plane crash near Provo, Utah prior to the 1964 season. In his short big-league career, Hubbs was considered to be an excellent fielder; assessments of his hitting were more mixed. In 1962, he became the first rookie to win a Gold Glove Award, and set several fielding records. Those achievements helped him win the National League Rookie of the Year Award that season. At the time of his death, Hubbs was considered to be one of the best defensive second basemen in the game. Hubbs was born in Riverside, California and resided in nearby Colton. He played in the 1954 Little League World Series. Colton represented California. They beat Virginia in the first round and Illinois in the second. In the final game of the Series, Schenectady beat California 5-3. Two future big league players played on the Schenectady team: Jim Barbieri, with the Los Angeles Dodgers, and Bill Connors, with the Chicago Cubs, both in 1966. Highlights of Hubbs playing defense at shortstop were captured on film. The video includes a play where Hubbs ran from the shortstop position to back up the second baseman and caught a bloop fly into short right field. He was elected ASB president at Colton High School his senior year. In high school he excelled in 3 sports, baseball, basketball and football. He was honored by CIF in all three. In 1958-59, he was a high school All-American in two sports, football (quarterback) and basketball. He was recruited by Notre Dame to play quarterback and by UCLA's John Wooden to play basketball. Hubbs signed as an amateur free agent with the Chicago Cubs prior to the 1959 season. That year, he played for Morristown, Tennessee in the Class D Appalachian League. He played outfield and shortstop in the all-rookie competition. He was in 59 games, had 198 at-bats and a batting average of .298. His 50 runs batted in and 8 home runs were enough to earn a nomination for player of the year in the Appalachian League. On July 18, 1959, he led the Morristown Cubs to a 20-0 victory over the first place Salem Pirates. Hubbs and teammate Jim Purslow each hit 2 home runs and a double. Each man scored 5 runs while the entire Pirate team was held to 4 hits. Morristown continued the offensive barrage 5 days later against Wytheville. Hubbs started a 7 run first inning with a home run, and his team won the slugfest, 9-7. Organized baseball initiated a player draft in 1959, in an attempt to cut down on large signing bonuses given to young players. The Cubs' AAA club in Ft. Worth recalled Hubbs in October and then purchased his contract outright in November. The end result of this maneuvering was to protect Hubbs from being drafted by another club. This was a sign that the Cubs clearly expected Hubbs to make the major league team in the near future. Hubbs went to the Cubs' rookie camp for spring training in 1960 as a shortstop/outfielder. During the 1961 season, the Cubs played Don Zimmer and Jerry Kindall at second base, both of whom struggled at the plate: while Zimmer made the National League All-Star team that year, he hit only .252 and Kindall .242. Hubbs was called up from the minor leagues to give the Cubs more offense at second base. He made his major league debut on September 10, 1961 against the Philadelphia Phillies, with three at-bats, two hits and one run batted in in a 12-5 Cub loss. He played in ten games in late 1961, with five hits in 26 at-bats and one home run. The New York Mets drafted Zimmer in the 1961 expansion draft and the Cubs traded Kindall, leaving Hubbs as the starting second baseman for ninth-place Chicago in 1962. He played in 160 games that season, with 172 hits with five home runs and 49 runs batted in. He led all National League rookies in games, hits, doubles, triples, runs and batting average. For that he was named the Rookie of the Year, earning 19 out of 20 votes and becoming the second consecutive Cubs player to win the award after Billy Williams had won the award the season before. Not until Jerome Walton in 1989 would another Cub win the Rookie of the Year Award. In the field, Hubbs set records with 78 consecutive games and 418 total chances without an error, breaking Bobby Doerr's Major League Baseball major league records, making him the first rookie to win a Gold Glove Award. He also led the league in two less desirable categories that season by striking out 129 times and grounding into 20 double plays. On September 30, he started a triple play in the final game of the season against the Mets. Hubbs was well liked by his teammates. Ernie Banks remembered, "Lots of young players do something special and you can't talk to them any more. Not Ken. One day, he got seven hits in a doubleheader. Pretty good for a rookie. But he didn't talk or act any differently than when he didn't get a hit." He was known for his faith. Reporters often noted that he did not smoke or drink alcohol, and that he attended church services while on the road with the team. With Hubbs's encouragement, teammate Ron Santo quit smoking. In 1963 Hubbs played in 155 games and batted only .235 with eight home runs and 47 runs batted in, but his superior fielding helped the Cubs finish over .500 at 82-80. Hubbs had a fear of flying. Roommate Ron Santo described the sheer terror he dealt with every time the Cubs flew to their next venue. He decided to challenge this fear head-on by taking flying lessons in the winter between 1963 and 1964, and received his pilot's license in January 1964. His long-time friend, Dennis Doyle, became a father the month after. The young mother had taken the train from Colton, California to Provo, Utah to spend time with her parents and their new grandchild. Hubbs and Doyle set out to surprise her by making a one-day flight to Provo on February 12. Once there, the pair decided to stay the night and return to Colton the next day. Hubbs played in a charity basketball game that night. A storm developed in the Utah Valley the morning of February 13. Hubbs thought he could beat the storm and decided to attempt the return flight. He and Doyle took off in a red and white Cessna 172 from Provo Airport, which sits on the edge of Utah Lake. He hadn't filed a flight plan, but just told airport staff that the pair were heading for Morrow Field near Colton, California. Euliss Hubbs, Ken's father, called to report that they had not arrived in Colton by Friday the 14th. A search began Saturday morning in areas of Utah, Nevada and California along a route the pair might have taken. Utah's civil aeronautics director, Harlon Bement, noted there had been no record of radio contact with Hubbs after takeoff, adding, "This means the plane could be fairly close [by]." Rescuers found the wreckage a quarter mile south of Bird Island in Utah Lake. The weather temperature was estimated as -1 °F, and it had been snowing heavily. Hubbs's funeral was held several days later in his hometown of Colton. Services were held in the Colton High School gymnasium because of the huge crowd that wanted to view Hubbs's casket. Fellow Cubs Ron Santo, Ernie Banks, Glen Hobbie and Don Elston were among the pallbearers. He was buried at Montecito Memorial Park, in Colton. Jim Murray of the Los Angeles Times wrote, "Kenneth Douglass Hubbs was more than just another baseball player. He was the kind of athlete all games need. A devout Mormon, a cheerful leader, a picture-book player, blond-haired, healthy, generous with his time for young boys; he was the kind of youth in short supply in these selfish times." Hubbs's uniform number 16 was never retired by the Cubs, but was kept out of circulation for about three years before being issued to another player. After his death, the Ken Hubbs Foundation was organized in his honor. Since 1964, the Ken Hubbs Award has been given to the best high school male athletes in the greater San Bernardino, California area. Colton High School has a gym named after Hubbs, which features a collection of trophies and other memorabilia. 1 2 Rob Neyer. Rob Neyer's Big Book of Baseball Lineups. Simon and Schuster. p. 48. ISBN 0-7432-4174-6. 1 2 "Cubs Star Killed in Utah Air Crash". New York Times. 1964-02-16. Archived from the original on 2007-03-12. Retrieved 2007-08-02. 1 2 3 4 5 Peter Golenbock. Wrigleyville, A Magical History Tour of the Chicago Cubs. St. Martin's Press. p. 382. ISBN 0-312-15699-5. ↑ "The Natural" by Bob Cunningham. Inland Empire magazine, May 1999, pg 50-53. ↑ "Two Long Streaks Snapped" The Sporting News, July 29, 1959, page 38. ↑ "Pair in Strikeout Show" The Sporting News, August 5, 1959, page, 42. ↑ "Cubs Tout Santo as an Outsider in Hot Sack Derby" The Sporting News, by Edgar Munzel, February 3, 1960, page 9. 1 2 "1962 Chicago Cubs stats in Baseball-Reference". Retrieved 2007-08-02. ↑ "Cubs-Phillies game stats in Baseball-Reference". Retrieved 2007-08-02. 1 2 3 "Ken Hubbs stats in Baseball-Reference". Retrieved 2007-08-02. ↑ David Nemec. The Baseball Rookies Encyclopedia. Brassey's Inc. p. 230. ISBN 1-57488-670-3. ↑ Peter Golenbock. Amazin': The Miraculous History of New York's Most Beloved Baseball Team. St. Martin's Press. p. 137. ISBN 0-312-30992-9. ↑ Mormons in the Major Leagues | by Jim Ison | Action Sports | Cincinnati | 1991| pg. 66-69. ↑ Snyder, John. Cubs Journal: Year by Year and Day by Day with the Chicago Cubs Since 1876. Emmis Books. p. 424. ISBN 1-57860-192-4. ↑ Zimnuich, Fran (2007). Shortened Seasons: The Untimely Deaths of Major League Baseball’s Stars and Journeymen. USA: Taylor Trade Publishing. p. 240. ISBN 9781589793637.